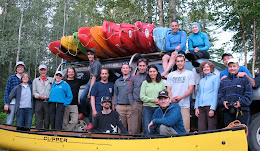 Last weekend the NWBPC held its annual paddle party in Loos, BC. 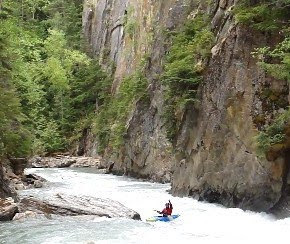 Located in the Robson Valley 200 km east of Prince George, Loos is a small community surrounded by mountains and some amazing rivers. Once again, this year’s event was at Wayne and Carol’s place. It has it all with lots of space for camping, a nice barbeque and fire, good sleeping in their cabin, and stunning views of the area. We had a solid turnout this year with people from Smithers, Burns Lake, Vanderhoof, and Prince George. On Saturday morning, there was a group of tandem canoeists and lots of kayakers keen to get on the river. 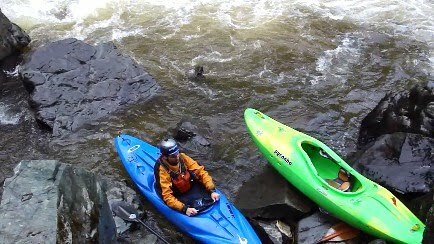 The canoeists headed off to the bottom section of the Morkill (class I) while the kayakers headed further up to the Lower Morkill (class II+). With summer melt well underway, river levels were considered to be high which is normal for this time of year. As you can see from the picture above, we had a fair sized group for our kayak run. The Lower Morkill starts from the first bridge across the Morkill and continues 11 km to the take-out located at a rock quarry where the river nears the road. 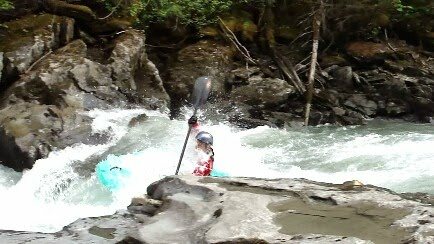 This run is a hoot with lots of fun rapids throughout, calm sections to enjoy the goreous scenery, and some great playspots. There were a few beginner boaters on our trip and considering the challenges they faced, they did amazingly well. Here’s a shot of Mike and Rick Brine, with Deanna in the background. After our run, we headed up to check out the big Morkill River waterfall. This is a spectacular part of the river where the entire Morkill plunges 30 m into a beautiful canyon below. Truly a sight to behold. We hung out here for awhile, took in the view and a few pictures. 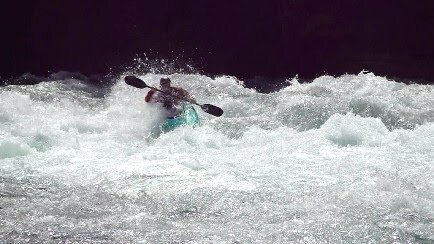 Having heard that years ago a group of Prince George kayakers successfully ran the canyon below the big falls, a couple of us were pretty curious about checking it out this year. 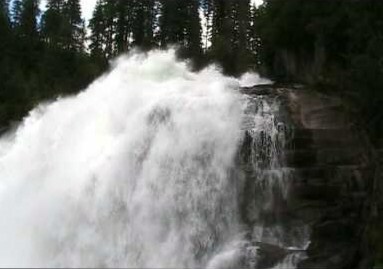 According to the reports of the run, it was a technical class III-IVish run with a 10 foot waterfall near the end. Mike and I were keen so after a quick hike down into the gorge to have a look at the entrance rapids, we decided it was good to go. As it turns out, the hike down was one of the most strenuous parts of the run. There was no trail, steep cliffs and drop-offs, and some seriously thick devil’s club. Maybe one day we’ll cut a trail because the hike was more than worth it. This is an awesome run! Definitely big water and fairly continuous in sections, but good eddies to scout from. 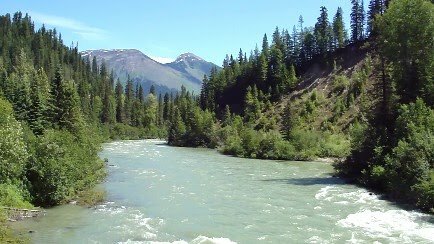 At our high water levels I would grade this as class III+ and similar in character to the Upper Fraser River above Overlander Falls. 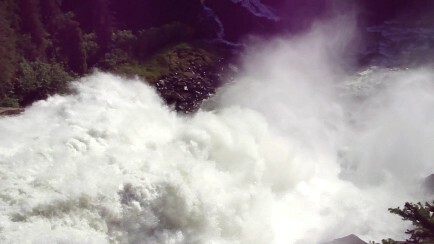 There were very large waves, some powerful diagonals, and a few holes and pour-overs. After escaping a mama bear and cub at the take-out bridge, we got back to Wayne and Carol’s where the barbeque was already in full-swing. A fun night around the fire with good food, some bevies, lots of laughs and chit chat. Jason ended up winning the coveted Paddle Party Prize - a NWBPC Guidebook - while Devin was the clear winner of another category. Hooray!! Sunday morning started off with a delicious breakfast cooked up by Wayne and Carol, and then it was off to the Goat River for more paddling. Most of the group did the Lower Goat starting at the highway 16 bridge (class II), while Mike and I did upper section above here (class II-III with a class IV canyon). By all accounts the day went very well for the beginners with everyone making it through in style, especially Rob who busted out a combat roll when it really mattered. Nice one dude! For the Upper Goat, I managed to get some good footage of our run through the canyon, pictured below. Thanks again to everyone who made it out to this year’s paddle party. It was a big success because of y’all, and especially because of Wayne and Carol for providing the awesome venue and all their efforts. Until next year, keep paddling! 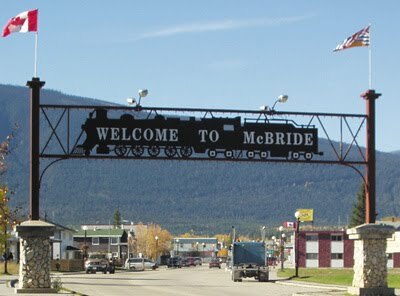 On June 10th of 2010, Mike, Ian and I went east to check out a couple creeks in McBride, the McKale and Castle. So far as we know these runs haven’t been done in years. Both are written up in Stuart Smith’s Rockies Whitewater Guidebook and appear in the Cariboo edition of the Backroads BC Mapbook. McKale Creek is located off Mountain View Road on the north side of the Fraser River. The take-out is at the first bridge across the creek and the put-in is 6 kms up McKale River Road. At the start of this road, there is an access gate which apparently remains open throughout summer when the road dries out. This run is easy to scout because the road parallels the creek the entire way. 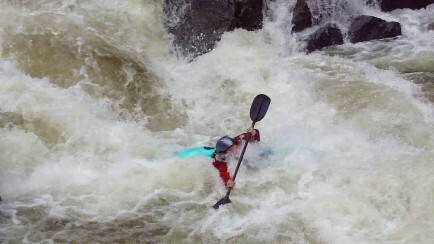 For the short stretch below the put-in and the bottom section between the first and second bridges, the run is similar to the Dore River with shallow class II-III boulder gardens. Beginning about 1 km below the put-in is a very long steep section with continuous, non-stop class III-IV rapids that goes all the way until the second bridge. This steep section has very few eddies and one class IV+ or V drop towards the end. As far as wood goes, during our scout we only found one log jam on the run, located in the bottom section. There were several logs sticking out here and there but nothing that wasn’t navigable. Overall, other than the big drop and the one log jam, all of the rapids were reasonable and the level was on the low side. However after all that scouting we decided against running it on this day. This is a stout stretch of whitewater worthy to return to though, so maybe later this season when I have a few more creeking days under me. 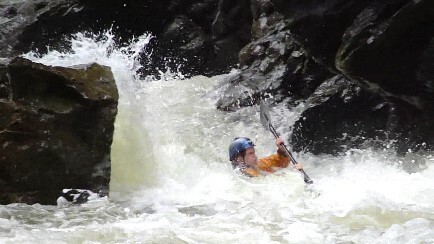 Castle Creek is on the south side of the Fraser, up Eddy Road and then up Castle FSR. 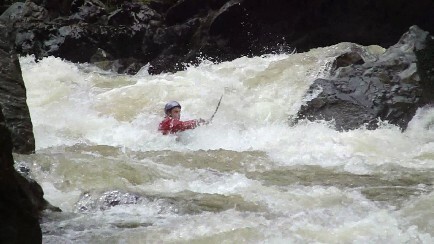 We did the lower section closest to the Fraser. In the guidebook the sections above this sound a little mellower. The put-in for the lower is located where a bridge used to cross the creek at about 8 km on the Castle FSR, but has since been removed. We used a new take-out not in any guidebook, from a newly built road heading out from a gravel pit 1.6 kms along the Castle FSR. This road crosses the creek and using it cuts out a lot of the flatwater from the traditional take-out on the Fraser River. The run starts out with about 2 kms of fun class III boulder gardens, with good eddies throughout. Some of this you can scout from the road. 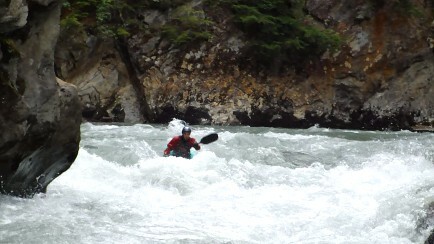 Following this, there was a long stretch of mostly flatwater until things picked up again and go into a long canyon. The canyon has three drops, all class III+ maybe the first one a bit harder. The two pictures below is the first drop. The next picture is the second drop, followed by two pix of the third and final drop. Unlike the McKale, you can't scout most of Castle Creek from the road. It would be a pretty heinous hike straight uphill through BC hell-bush if you decided not to run the canyon. Not far after the canyon ends though after a few mellower rapids is the take-out bridge.There was no bad wood for our entire run, and the bike shuttle only took about 30 minutes. The level was probably medium-low. Even if you’re not into paddling the Castle, I would recommend taking a trip up there soon to check out the spectacular mountain scenery. Apparently part of the Castle FSR will be deactivated sometime later this summer. 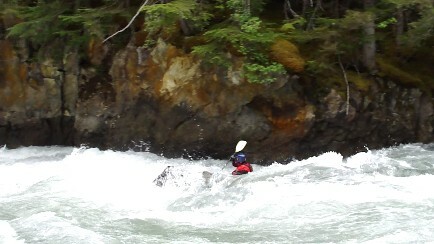 Enter the Lower Lower Willow --- probably the most technical piece of runnable whitewater closest to Prince George. 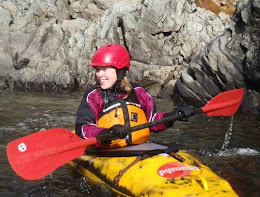 While this may not be saying much at moderate water levels, the drops and boulder gardens starting below Killer Canyon provide a pretty good test piece for intermediate paddlers. Moderate water levels for this run are around the time when the playboating upstream of the highway bridge starts to drop off. This spring a small group of us have been getting out on the Double L-Dub at higher levels. 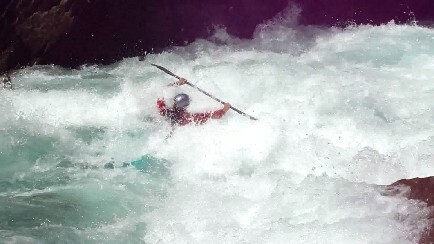 In this narrow canyon, even a slight increase in volume has a dramatic effect on the river making for more challenging rapids. Most of the calm pools between the drops disappear and the mid-stream rocks become large holes or waves. It's quite pushy and continuous but there are still good eddies to recover and scout from. 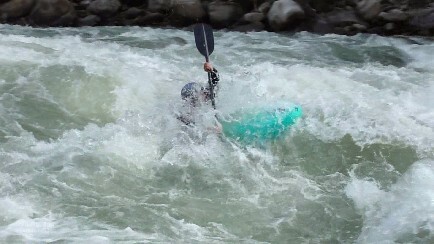 While this is a short run, to me it is without question the most exhilarating stretch of whitewater near town. 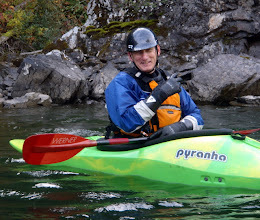 And once you include the 10 minute downclimb into the canyon and the 20 minute uphill hike from the take-out, you have the complete PG paddler advanced workout. Consider the mosquitoes a bonus. From the cliff gauge by the highway bridge, moderate levels for the Lower Lower Willow are between -4 and -2, with whitewater up to grade III+. 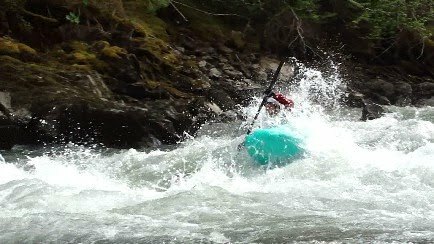 If you haven't already seen it, here's a video from last summer of the run at moderate levels: VIDEO. When the level nears -1 as it is in all of the pictures included in this post, it becomes grade IV. I've never done this run much higher than this but others have. Although there are large holes in some of the drops at high flows, the main hazard to be aware of in this section of river is wood as there are numerous places for logs to get hung up. Scouting is critical. 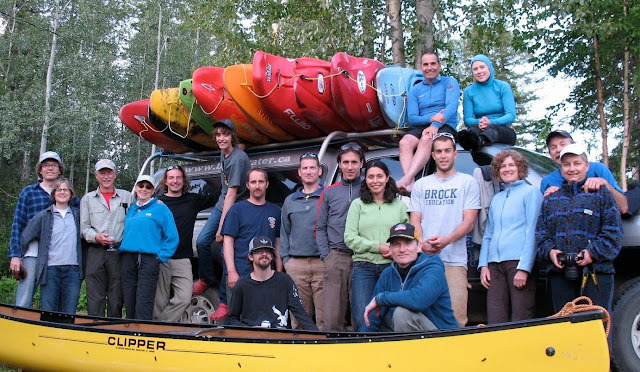 Stay tuned for the Prince George Paddle Party on June 26-27th, held out at the confluence of the Morkill and Fraser Rivers. 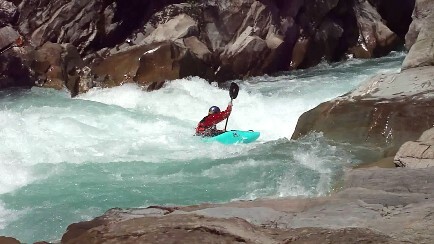 A beautiful place in the mountains with fun people and awesome whitewater for all levels of boaters. Click here for more info: PG Paddle Party. 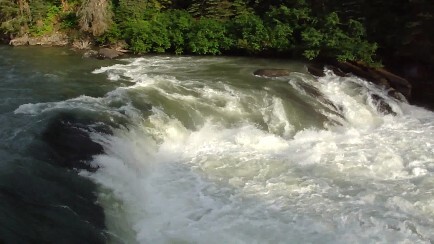 Below is a pic of the 30 m Morkill Falls.